Among the manuscripts of legal content, the so-called Mirrors of Saxony are probably the most antique books of medieval law. Around 400 manuscripts and fragments exist. In such production, the Oldenburg Mirror of Saxony is an outstanding example because it is one of the few manuscripts in which the miniatures are organized in picture columns, in a way in which the decoration flanks the text that it represents. 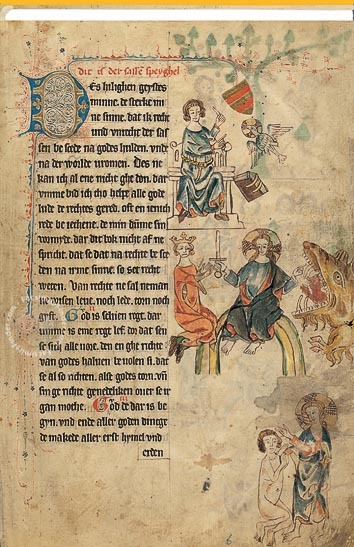 The manuscripts of the Mirror of Saxony provide precious information about properties and territorial law in the late Middle Ages; in this sense, they are exceptional sources in cultural history. The Mirror of the Saxons comprises laws concerned with the space occupied by the property owners and the peasants. The text touches on penal law, property law, inheritance law, marriage law, along with laws regulating the keeping and hunting of animals. The text was widely disseminated in Germany and then translated in Dutch, Polish, and Russian. The Oldenburg Mirror of Saxony writes records of everyday applied law no longer in Latin, but in the vernacular language of the everyday life. Eike von Repgow (1180-1235) translated the text into Middle German with the intention of stabilizing what up until the thirteenth century had been a long oral tradition of regional jurisprudence. 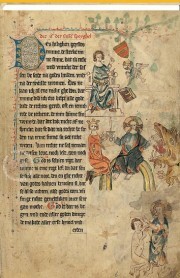 The copy in Oldenburg was made in 1336, when the Benedectine monk Hinrik Gloyesten copied the text under the patronage of count John III of Oldenburg. John III asked the law to be written in order to provide his country with fixed rules. The development of legal regulations should have been in agreement with the previous tradition. The Pope stated the necessity of writing the law in total respect with the Christian thought. In a bill of 1374, Pope Gregory XI banned fourteen articles contained in the Mirror of Saxony because their content was judged to be heretical. The title “Mirror”, assigned to the book at the time of its production, linked the text to the medieval literature of the Sachzenspiegel, which contained moral and ethical examples. The mirrors books, including the mirror of Saxony, were called this way because provided rules that were reflections of the natural order of the world. Written in an elegant Gothic textura, commonly used for quality books, the script is regular and precise. The large ductus makes the text easily readable. Only four manuscripts of the Mirror of the Saxons are illuminated. The miniatures probably had functional purpose along with decorative role. They helped remember the legal content contained in the codex. The illustrations show a high level of execution and provide clues about medieval society, for example in matter of gender, social status, and ethnicity. The illuminator fully colored some of the miniatures and left part of the illuminations outlined in pen. On folio 87 the decoration stops. From that folio on, the space planned for the picture column remains empty, while the decoration of the initials continues up to the end of the manuscript. Although incomplete, the decoration has an essential role because it contains scenes of everyday life. The detailed depictions of clothes, tools, interior and exterior architectures offer fascinating glimpses into medieval culture. Manuscript book on parchment − 32.8 × 22.8 cm − 272 pp. 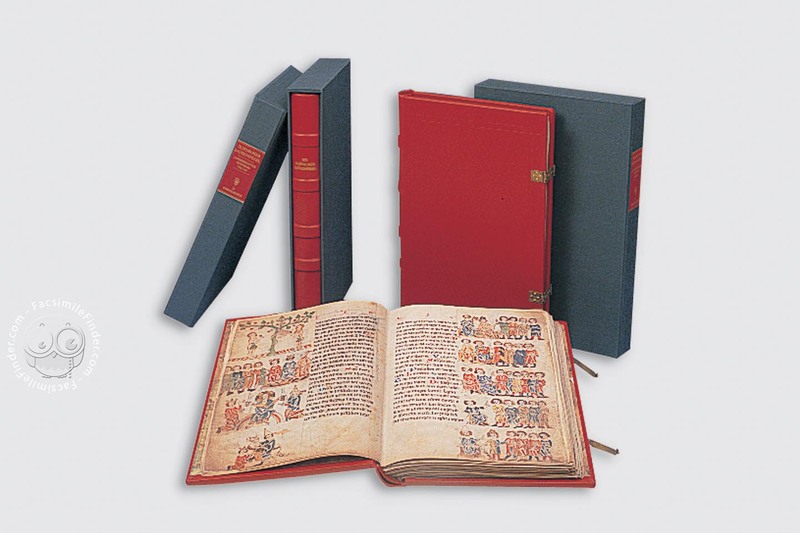 Full-size color reproduction of the entire original document, Oldenburg Mirror of Saxony: the facsimile attempts to replicate the look-and-feel and physical features of the original document; pages are trimmed according to the original format; the binding might not be consistent with the current document binding. Leather with blind embossing and two clasps (imitation of the 1877 manufactured original cover).